Over 12 different countries to choose from. If you use stamp sheets for your unit objectives, give them a stamp with these culturally rich images. Students will love to have their paper marked with this! Blue ink makes it look just like facebook. Self inking with blue ink $16. Our favorite Spanish chiste for the double meaning of the word “nada” in Spanish. Great graphic organizer for students, can use as cheat sheet for homework, as study guide, differentiating for students, or as student incentives. Same size as a business card. Same as our present tense card, but now featuring the endings and irregular forms of the preterite! Great visual aide for students! 2″ x 6″ Glossy finish bookmark. Great for student prizes. I have seen your Star Wars papa parody floating around on Pinterest, but I cannot find it here for purchase…where can I find it? 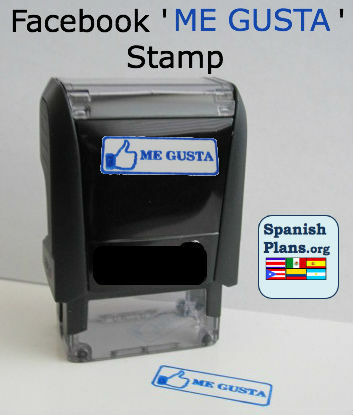 Can I replace the ink in the Me gusta stamp??? Do you happen to have a size chart for the pez tshirt? Thank you.